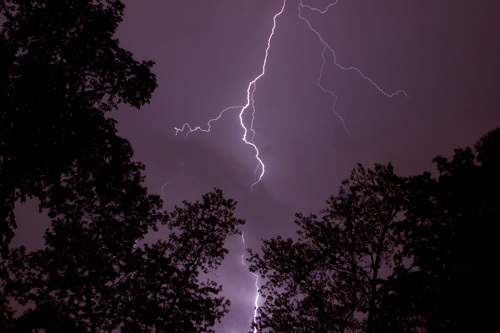 Strong storms swept through our area of Northern Ohio tonight setting off fireworks of the electrical kind. This is the best lightning shot I've ever made and I hope to do more and better. Fortunately I have two sheltered areas at home from which to shoot… and this powerful lightning bolt isn't as close as it may appear! That is a beautiful shot James! Absolutely beautiful! What a wonderful picture. Amazing that you got it at the right moment!! Great timing. I'm more the run-inside-type when lightning is around.